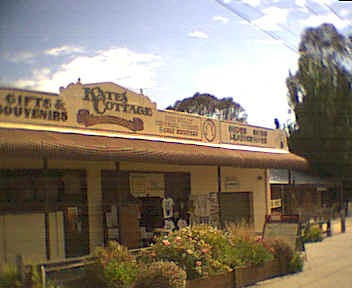 Kate's Cottage, located in Glenrowan's tourism strip in the main drag, is run by great friends of mine ,Rod and Chris Gerrett, both great people, and there shop in Glenrowan is a must for any traveller to Glenrowan, they sell everything from Ned Kelly books to soaps, a must for anyone. You can catch a glimpse of yesteryear in this fantastic store, and museum out the back, which is a replica of the original Kelly Homestead, fantastic, for such an entrance fee, you can't possibly go wrong. Also, photographs are most welcome. Rod and Chris Gerrett have been in the Kelly business for over 15 years, and you'll never see another side of sympathizer than the Gerrett's. They offer and questions you may have on the Kelly gang. The animatronic show, which is a supposed world famous, and quoting below from the Anamatronic show's website. Don’t tell me that at some time in your life you haven’t fantasised about going back into history and participating in an historical event. Well here is your chance to live that dream. For through the brilliance of animation and computerised robots, you will be transferred back in time, over 100 years, to witness the events that lead up to the capture of the Kelly Gang. Starting as hostages in the hotel, and then onto gunfights - burning buildings - shoot outs - a decent hanging, finishing in our magnificent painting gallery. The show is educational, historically correct and entertaining. It runs for 40 minutes every half hour (in separate rooms) from 9.30am to 4.30pm daily. Only for people who want to enjoy themselves. For more information phone (03) 5766 2367.